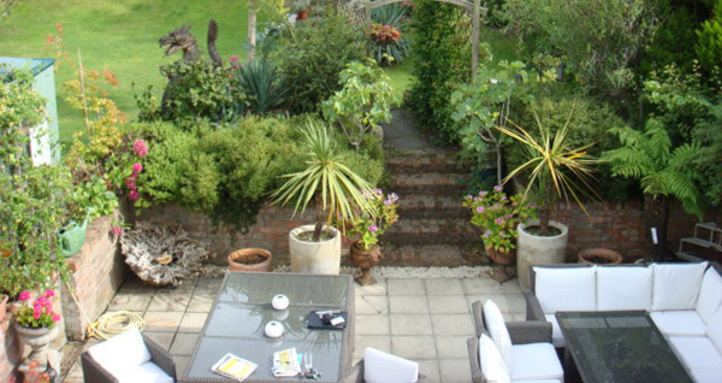 Ken and Karen offer a relaxed family-run Bed and Breakfast in Cheltenham with all bedrooms being en-suite and to a high comfortable standard. Our B&B has four bedrooms on the ground floor and all come with bottled water, tea, coffee, hot chocolate, a fridge, Freeview TV and free WiFi. The guest house is only a 2 minute walk from Cheltenham Spa Railway Station (a mainline station with easy access to all parts of England, Scotland and Wales) and is a short 10 minute walk to the Coach Station, 20-25 minutes to the Town Centre and 15-20 minutes from Montpelier. If you're travelling by car, we are located 5 minutes from junctions 10 and 11 on the M5, so we're easy to get to. And we've parking space for up to 10 cars at the front of the guest house. All areas of the Cotswolds are easily accessible by car or public transport with regular bus services to Cheltenham Town Centre, Cheltenham Racecourse and the beautiful Cotswold villages of Winchcombe, Broadway, Bibury, Stow-on-the-Wold and surrounding areas. Ken & Karen are only too happy to help tourists with their local knowledge. Having a relaxing & comfortable B&B to stay in after a full day of sight seeing or shopping is very important, and that is what we offer. If you're visiting Cheltenham on business, then you'll be close to the major business parks including major organisations such as GCHQ, Messier Dowty and Zurich. We welcome longer term guests offering a more affordable and more homely place for employees or business guests to stay rather than a hotel. View interior and exterior photos of the guest house, check out our room rates, testimonials or contact us for further information. We’re always happy to answer questions about the B&B, Cheltenham or surrounding areas.